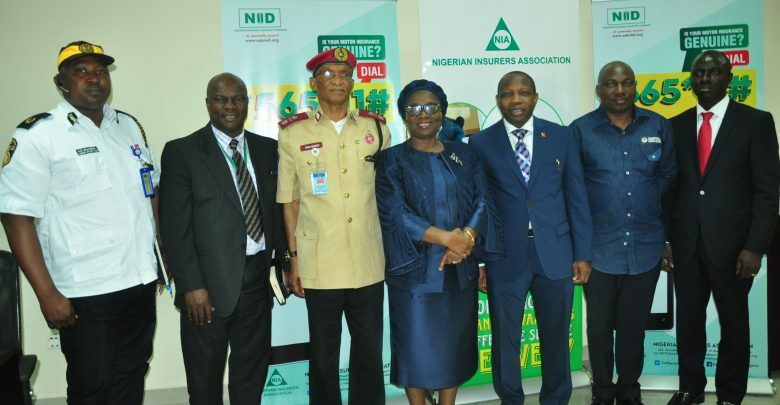 L-R; Mr. H. O. Balogun, representing the Vehicle Inspection Service (VIS), Lagos; Abel Omokade, representing Commissioner for Insurance, NAICOM; John Meheux, Zonal Commanding Officer, Ogun & Lagos, Federal Road Safety Corps; Yetunde Ilori, Director General, Nigerian Insurers Association (NIA); Mr. Tope Smart, Chairman, NIA; Lanre Iyanda, General Manager, Courteville Business Solution Plc, and Niyi Alao, Acting Managing Director, Nigerian Interbank Settlement Systems, during the NIA launch of Nigerian Insurance Industry Database, USSD code *565*11# in Lagos on Thursday. 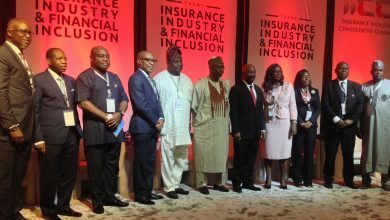 BY NKECHI NAECHE–Poised eradicate fake motor insurance policies in the country, the umbrella body of the insurance industry, the Nigerian insurers Association (NIA) on Monday launched the industry’s USSD code *565*11# in the industry. This means vehicle owners can check if the their motor insurance policies are genuine and when it will expire, by diailing *565*11# with any mobile phone. L-R: Mr. Austen Ebose, Managing Director, Anchor Insurance Company Ltd; Yinka Adekoya, Managing Director/CEO,Wapic Insurance Plc; Tope Smart, Chairman, Nigerian Insurers Association and Mr. 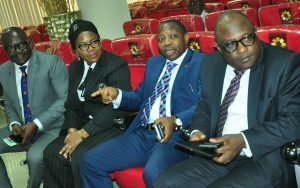 Bode Opadokun, Managing Director/CEO, FBN General Insurance Ltd, during the NIA launch of Nigerian Insurance Industry Database, USSD code *565*11# in Lagos on Thursday. It works independent of internet connectivity. In this instance, any mobile phone (not necessarily a smartphone) would communicate with the NIID system to retrieve policy status whenever required. Speaking at the launch of the code, the Chairman of the Association, Tope Smart, said the launch is a step towards bringing insurance closer to the people and ultimately eliminating fake insurance certificates in the market. He recalled that in 2010 the Association took a major step towards eliminating fake insurance certificates in the market through the inception of the Nigerian Insurance Industry Database (NIID). The database according to him went live in 2011 and insurance policies obtained by motorists could be checked real time online on the internet and through dedicated hand held devices. He added that the industry has continued to reap the benefits of the scheme. He noted that before the establishment of the platform, cloning andfaking of insurance certificates was a thriving business but the establishment of the database has assisted the industry in reducing the incidents of fake insurance certificates in the market. Till date, there are over 3(three) million vehicle details on the platform. 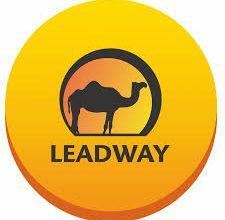 The platform he added has been enhanced to include Stolen Vehicles and Claims Reporting modules in response to the challenges thrown up by actions of suspected fraudsters that made multiple claims with the intent to defraud the industry over the last few years. 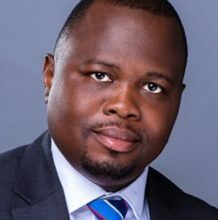 The NIA chairman who also doubles as the Group Managing Director, NEM Insurance Plc said that the NIID platform had been operational nationwide. He added that “with challenges in verification in areas with poor internet coverage. Verification of motor certificates through the dedicated devices became highly impaired due to the vicissitudes of internet operations in the hinterlands. This led to the introduction of the USSD technology. “The USSD (Unstructured Supplementary Service Data) is a Global System for Mobile Communication (GSM) technology used to send text between a mobile phone and an application programme in the network. It works independent of internet connectivity. In this instance, any mobile phone (not necessarily a smartphone) would communicate with the NIID system to retrieve policy status whenever required. “It is hoped that with the USSD, we would have fully overcome the problems associated with the dedicated devices as it guarantees uninterrupted service throughout the country and on all networks. “Our existing and prospective customers now have the opportunity to confirm the genuineness of their respective policies at the time of purchase to avoid any embarrassment should claim occur. 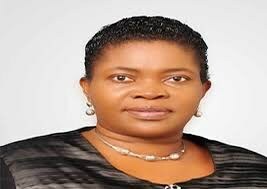 “We want to thank our partners in this journey– Nigeria Inter-Bank Settlement System Plc. and CourtevilleBusiness Solutions Plc. for their support and do assure them of more strategic partnerships as we develop other modules to improve insurance business in Nigeria. 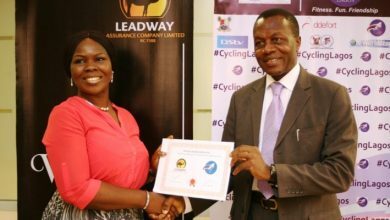 “The successrecorded so far cannot be complete without acknowledging the co-operation and support received from the Federal Road Safety Commission (FRSC),Vehicle Inspection Services (VIS) of various States, Nigeria Police Force (NPF), National Union of Road Transport Workers (NURTW) and other stakeholders in the insurance industry. “We are optimistic that they will extend a greater level of support to the Association in our desire to eliminate fake insurance certificates and extinguish the parallel market whilst also bringing insurance services closer to the people. Speaking further, Ag. Managing Director/CEO at the Nigeria Inter-Bank Settlement System Plc (NIBSS), Ezekiel Oyeniyi Ajao, said the process and discussions began in 2016 and the pilot test lasted for one year in 2018. He said the core mandate is to bring convenience to motor insurance policy holders and grow the industry that provide such service. He said NIBSS will continue to work with the industry to achieve positive results just as it has done in other financial sectors of the economy. Also, Zonal Commanding Officer for Zone RS2 of the Federal Road Safety Corps, John Meheux applauded the industry for the new initiative, adding that the code will help the motor policy holders to know if their policy is genuine and date of renewal. He said the law enforcement agencies are expecting more from the industry, assuring that in 2019 the FRSC will work close with the industry.